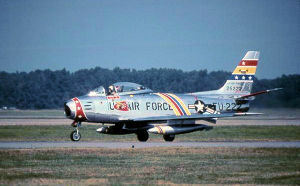 North American F-86F-35-NA Sabre Serial 52-5222 of the 72d Fighter-Bomber Squadron. The aircraft has been restored and is painted in the Wing Commander's motif, with blue, yellow and red striping. It is presently in private hands as civil registration N86FS. 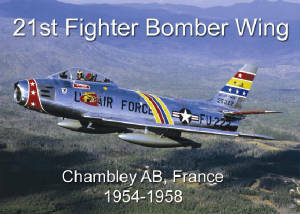 The first USAF unit to use Chambley AB was the 21st Fighter-Bomber Wing, being transferred from George AFB, California . The wing's deployment to France had to be carried out in stages. Four echelons of wing personnel variously traveled by train, ship, and air to reach Chambley between November 1954 and January 1955. 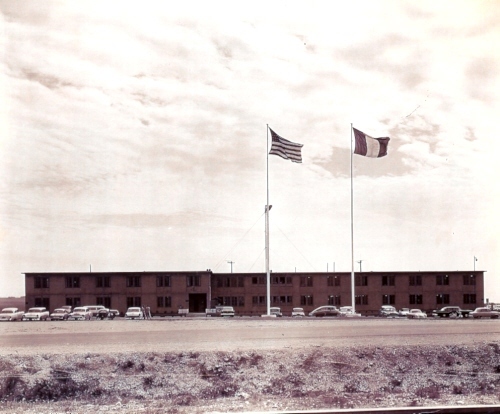 The 21 FBW officially established its headquarters at Chambley on 12 December 1954 . The 21 FBW consisted of three squadrons, the 72d, 416th and 531st Fighter-Bomber Squadrons, equipped with the F-86F "Sabre". Upon their arrival, the facilities at Chambley were not ready for aircraft use, and the squadrons had to deploy elsewhere. The 72d deployed to Chateauroux AB , while the 416th and 531st operated out of Toul-Rosieres AB. After many construction delays, the wing combined its fighter squadrons at Chambley on 15 April 1955 . The squadrons carried out close air support training missions with the Army, then took first place at the United States Air Forces in Europe (USAFE) "Gunnery Meet" at Wheelus Air Base, Libya . The 21 FBW participated in the Atomic Warfare exercise "Carte Blanche," and went on to take an overall second place in the Nellis AFB, Nevada "Gunnery Meet" in 1956. Moreover, they won the USAFE "Award for Tactical Proficiency" for the January-June period of 1957. In 1957, the French Government decreed that all nuclear weapons and delivery aircraft had to be removed from French soil by July 1958. As a result, the F-86's of the 21st Fighter-Bomber Wing had to be removed from France . During October 1957 it was announced that the 21 FBW would be inactivated on 8 February 1958 , and that its assets would be dispersed among existing USAFE units. With the departure of the wing, Chambley-Bussieres AB was placed in reserve status. The 21st Fighter Wing was reactivated at Misawa AB , Japan a few months later on 1 July 1958 , inheriting the lineage of the 21st FBW. Major General R. Rowland retired as Chief of Staff, Tactical Air Command, Langley Air Force Base, VA.
General Rowland was born in Lodi, Ohio in 1917. He graduated from Lodi High School in 1935; attended Ohio State University of Maryland, majoring in sciences. He entered the Army Air Corps at Fort Hays, Columbus, Ohio in January 1938, followed immediately by assignment to primary flying school, Randolph Field, Texas, and graduated from pursuit course at Kelly Field, Texas, 1 February 1939. 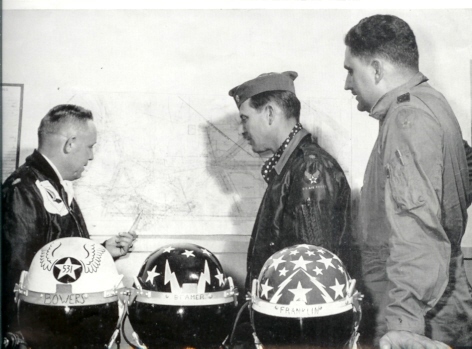 The general's first assignment was with the 94th Pursuit Squadron, 1st Pursuit Group, Selfridge Field, Mich. He was transferred to the 16th Pursuit Group, Albrook Field, Canal Zone, where he successively held duties as tactical pilot, squadron adjutant, squadron armament and groupd armanment officer, base ordance and base chemical warfare officer. In September 1941, he returned to the United States and was assigned as flight instructor and squadron operations officer, Air Corps Advanced Flying School, Craig Field, Ala. 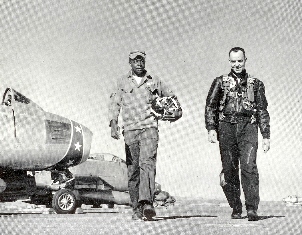 In December 1941, he was transferred to Tuskegee Army Flying School, Tuskegee, Ala, where he held positions as director of advanced training and director of fighter training until February 1943. In February 1943, he was transferred to the 348th Fighter Group, Providence, R.I. as group executive officer. In May 1943 he accompanied that group when it was deployed to New Gujinea - the first P-47 group assigned to the Southwest Pacific. He assumed command of the 348th Fighter Group in November 1943, and held that position until his return to the United States in June 1945. During World War II, he flew 203 combat missions totaling 400 combat hours and became an ace by destroying eight confirmed enemy aircraft. He participated in nine major campaigns in the New Guinea, Philippines, Solomon Island and the South China area, where his unit specialized in air-ground close support and support of amphibious operations. During one month of the Philippine campaign, his fighter group dropped a greater tonnage of bombs than any single bomber group in the theater. Ground forces intelligence credited his group with the destruction of more than 10,000 Japanese military personnel during this period. During one phase in which they were concentrating on the air superiority mission, his group shot down 231 confirmed Japanese aircraft in the air while suffering the combat loss of but one of their own pilots. Upon return from combat, General Rowland was assigned as chief, Tactical Air Force Branch, Tactical Air Force and Joint Training Divison, Continental Air Forces at Bolling Field.D.C. Upon activation of the Strategic Air Command in July 1946, he was assigned as chief, Operations Division and held that position until August 1947 when he was reassigned to the Air Command and Staff School, Maxwell Air Force Base, Ala. Following graduation from the command and staff school, General Rowland was given a series of instructor assignments at that school, including chief, Plans and Special Operations Branch, and chief, Operations and Intelligence Division. He attended the Air War College at Maxwell Air Force Base, graduating in June 1952. In June 1952, General Rowland was assigned to the Central Intelligence Agency, Washington, D.C., leaving that organization in April 1953 to assume command of the 21st Fighter Bomber Wing, which was equipped with F-86s at George Air Force Base, California. 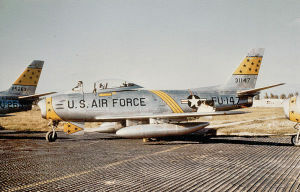 This was the first tactical F-896 wing to be equipped and trained for special weapons (nuclear) operations. During the following two years, the 21st Fighter Bomber Wing was employed by Tactical Air Command to develop new mobility and forward-rear base concepts to include numerous deployments to Alaska and throughout the continental Unites States. His organization conducted the first jet goodwill tour through the various countries of Central and South America in 1954. 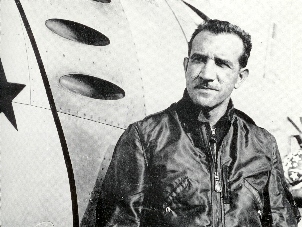 General Rowland accompanied the 21st Fighter Bomber Wing when it departed the United States in December 1954 for a NATO assignment at Chambley Air Base, France, remaining at that station until July 1956 when he was transferred to Ramstein, Germany as deputy chief of staff, operations, Headquarters 12th Air Force. Upon deactivation of the 12th Air Force in 1957, he became the assistant deputy chief of staff, operations, U.S. Force in Europe, and held that position until his return to the United States in July 1958 for further assignment as deputy director of plans for policy, director of plans, Deputy Chief of Staff/Plans and Programs, Headquarters U.S. Air Force. In july 1960 he became secretary of the Air Staff, U.S. Air Force. In December 1962, General Rowland became chief, Air Force Section, Military Assistance Advisory Group, Vietnam. In this assignment he was charged with the responsibility for planning, programming and training of the rapidly expanding Vietnamese air force, which at the same time, was deeply involved in conducting combat operations against the Viet Cong insurgents throughout the country. During May 1964 the Military Assistance Advisory Group was deactivated and the Air Force Section was redesigned as the Military Assistance Command, Military Asssistance Command, Vietnam. General Rowland continued as chief of the Air Force Advisory Group until he departed Vietnam to become chief of staff, Pacific Air Forces, effective 1 September 1965. General Rowland was promoted Major General, two-star grade, on 30 April 1965. NOTE: Colonel Robert N. Baker assumed command of the 21st Fighter Bomber Wing, Chambley Air Base, France in 1956 on General Rowland's transfer to Headquarters, 12th Air Force, Ramstein AB, Germany.